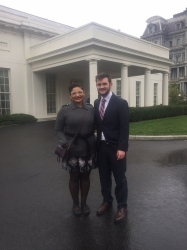 Two Saint Xavier University (SXU) students, Sean Anderson and Mia Guevara, experienced an once-in-a-lifetime opportunity to visit the White House last week due to College Radio Day. This special day is an annual event sponsored by the College Radio Foundation to unite college radio stations around the country, while celebrating its important contributions to music, journalism and the radio industry. Ten universities across the nation attended this special College Radio Day visit. Students met and interviewed high-ranking government officials and were credentialed members of the White House press corps for the day, which allowed them access to the James S. Brady Press Briefing Room. Topics discussed during the meeting included college affordability, student loans and climate change. The group also met with press secretary Josh Earnest to discuss his role in the media and the importance of college media in today’s society. This annual event was co-founded by SXU’s very own Peter Kreten, director of Student Media, back in December 2010.